Don’t get me wrong, I like working in the lab- but there is something horrifying about feeling stuck in a project when the only thing you can do to finish it are tedious, repetitive tasks that require your utmost attention. You simply have to take your time, no short cuts. To add another layer of stress, there is a limited quantity of blood. Most of the blood samples have been used for other assays (I don’t even want to consider the effect the multiple freeze/thaw cycles has had on the stability of what I am looking for. OH MY GOD). Having limited blood is tricky because if I do make a mistake, which I have done, I severely run the risk of decreasing my sample size. She’s the best. You should really meet her. 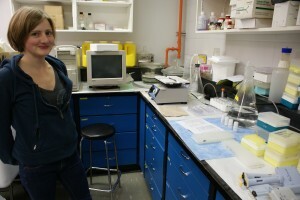 Published by Zsofia on 2011/11/06 at 9:14 PM under Grad school experience, Research. 1 comment.